Before Nibiru arrived in the inner solar system and instituted a daily Figure 8 wobble in the Earth in 2004, Manhattanhenge fell regularly on May 28. Cosmology works like this. It is precise and consistent. This was the case in 2002, on record to be the case. But after Nibiru’s arrival, excuses started appearing. For Manhattan, a place where the evening matters more than the morning, that special day comes on May 28; one of only two days in the year when the Sun sets in exact alignment with the Manhattan grid, fully illuminating every single cross-street for the last fifteen minutes of daylight. The other day is July 11th. Had Manhattan's grid been perfectly aligned with the geographic north-south line, then our special day would be the spring equinox, and if we so designated, the autumn equinox—the only two days on the calendar when the Sun rises due east and sets due west. But Manhattan is rotated 30 degrees east from geographic north, shifting the days of alignment elsewhere into the calendar. Upon studying American culture, and what is important to it, future anthropologists might credit the Manhattan alignments to cosmic signs of Memorial Day and, of course, the All-Star break. War and baseball. While the May 28 sunset qualifies as the exact day for this auspicious moment, the surrounding days will also work, as the sunset point migrates slowly north from day to day along the horizon, bringing with it ever-lengthening daylight hours. 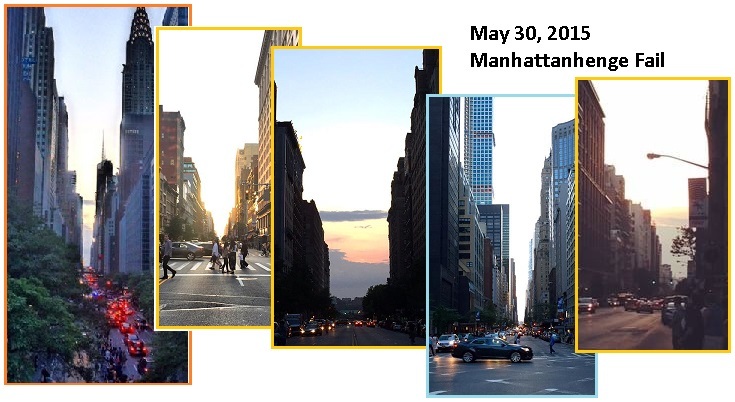 The first Manhattanhenge occurs around May 28, while the second occurs around July 12. The precise dates of Manhattanhenge depend on the date of the summer solstice, which varies from year to year but remains close to June 21. 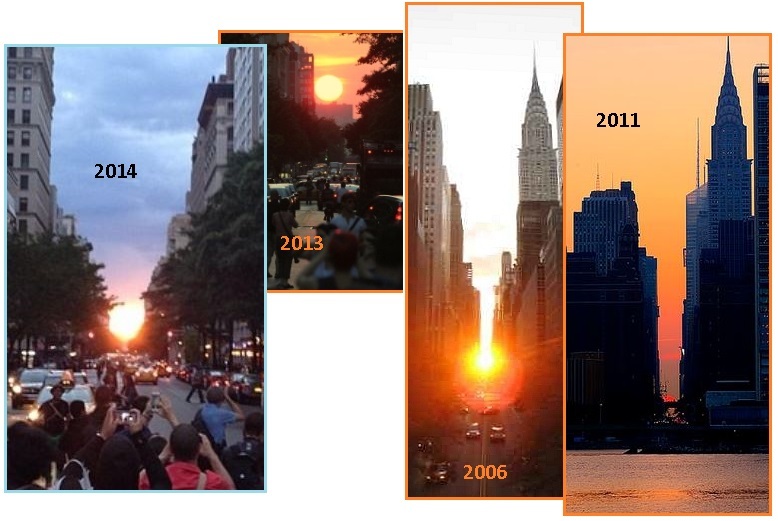 In 2014, the "full sun" Manhattanhenge occurred on May 30 at 8:18 p.m., and on July 11 at 8:24 p.m. The event has attracted increasing attention in recent years. The dates in which sunrise aligns with the streets on the Manhattan grid are evenly spaced around the winter solstice, and correspond approximately to December 5 and January 8. 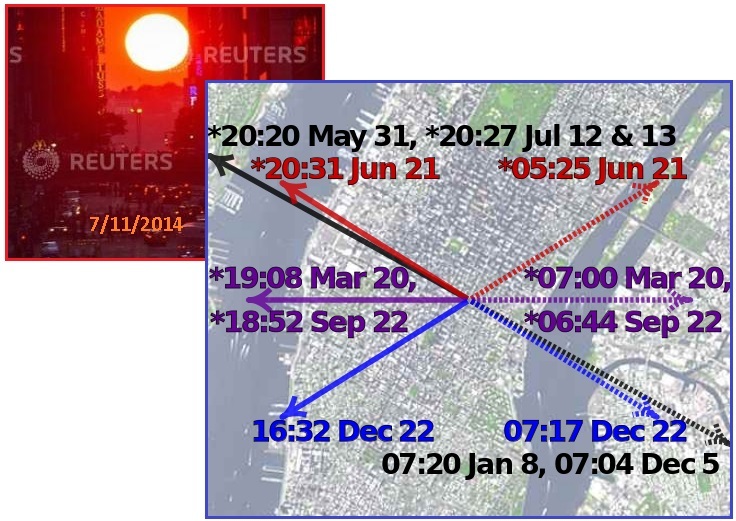 Erratic dates for “the moment” when Manhattanhenge would occur became more and unpredictable, even requiring a last minute tweek from Neil deGrasse Tyson. All this of course with no explanation, as the cover-up over the presence of Nibiru, aka Planet X nearby was still in force. You will note that the Sun did appear, however, in spite of haze or cloud cover. 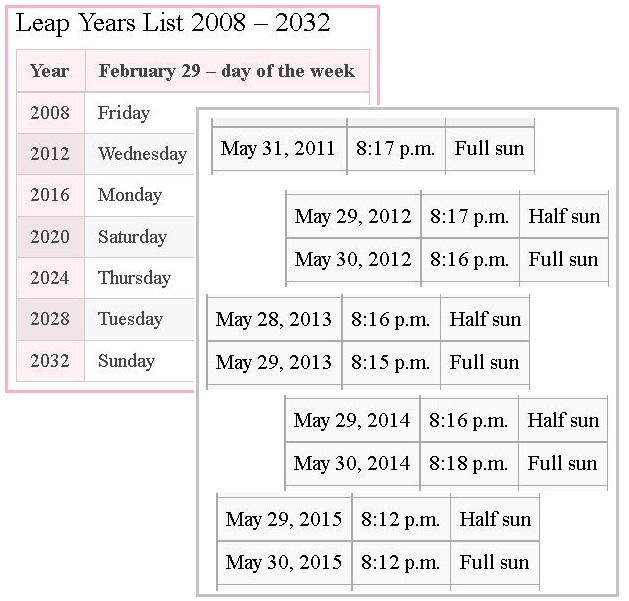 You will also note that the wandering unpredictable dates had nothing to do with the year being a leap year. Addendum – Hmm. 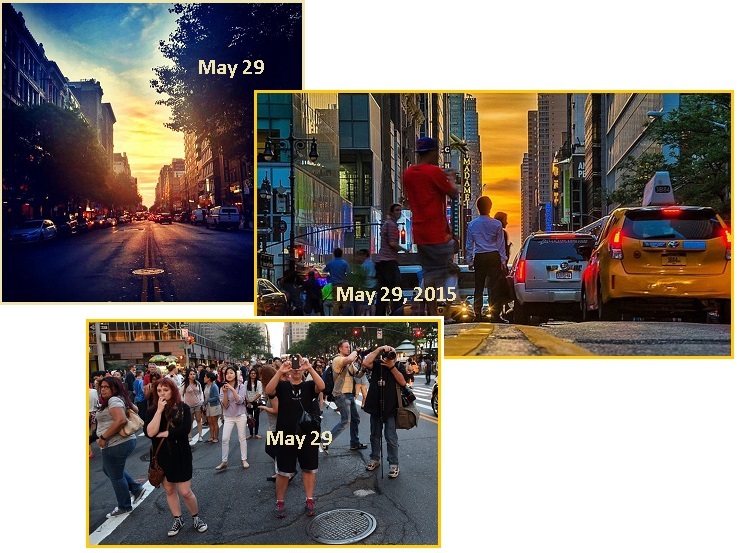 A bit of debate as to this year’s date for Manhattanhenge. I thought it was May 29th, AM NY says May 30, but apparently it’s May 31st this year! Dr Tyson – it’s time for an official Manhattanhenge website to keep us all straight. This was shot from 2011 on Long Island City at Gantry State Park. Scene from New York City 12 months ago. People watch and photograph the sunset on 14th Street during 'Manhattanhenge' on May 29, 2013 in New York City. Astrophysics Neil deGrasse Tyson coined the term after Stonehenge, the prehistoric circle of stones in Wiltshire, England that continuously draws curious visitors. Manhattanhenge, he says, is an homage to Stonehenge and how it annually aligns with the rising sun during the summer solstice. So what happened in 2015? The dates were widely published, and the loyal crowds came out on both the half-Sun and full-Sun days, but the Sun was a no-show! This was blamed on the clouds, but as can be seen from prior years, neither haze nor cloud cover can block the Sun. It was a no show. Half Sun on the Grid: Friday, May 29 8:12 P.M. EDT. Monday, July 13 8:21 P.M. EDT. Full Sun on the Grid:Saturday, May 30 8:12 P.M. EDT. Sunday, July 12 8:20 P.M. EDT. Due to cloud cover the Sun was not visible. Manhattan was aglow with a smeared golden light as the sun aligned with city cross streets, bursting through a cloudy sky. The haziness gave photos of the biannual phenomenon a Monet-like quality. Manhattanhenge fans were saddened by the weather’s impact on the typically voluminous sun, but that didn’t stop crowds from blocking intersections. Congrats you city dwellers had a sunset. Yehe har har. … Just was severely underwhelming. Was it the weather? On both days there was no heavy rain or cloud cover over New York City. It takes more than this to block the Sun. And what was the result on the full-Sun day, the evening of May 30, 2015? Another no-show. What this means is that the Earth wobble has gotten more extreme and more erratic. Perhaps when the presence of Nibiru nearby is officially admitted, Neil deGrasse Tyson will be able to admit that fact. Viewers can get a glimpse of the display tonight according to the American Museum of Natural History. “A rare and beautiful sight,” Tyson writes. “For these two days, as the sun sets on the grid, half the disk sits above and half below the horizon.” … The #clouds missed the memo and ruined it. … #Manhattanhenge fail … #Manhattanhenge was a bust but the moon looked cool … #Manhattanhenge didn't happen these past two days … The most photographed cloud in the history of the City of New York #Manhattanhenge … Tried to catch the #manhattanhenge but it was a #fail. ZetaTalk Insight 6/6/2015: Poor Neil deGrasse Tyson, caught between obvious evidence of the Earth wobble and the many delays in Obama’s anticipated announcement admitting the presence of Nibiru. What can he say? In prior years, such as in 2007, last minute tweeking allowed Neil to save face. But this year matters went terribly wrong, the Earth moving under the polar push of the daily Figure 8 wobble to the extent that the Sun went down before it was anticipated to arrive, disappearing over the horizon as the Earth tilted its N Pole away putting the bulge of the Earth’s fat middle between New York City and the setting Sun. Sudden. Untimely. No time to alter the forecast. Perhaps Neil and Nancy can discuss this as an example of the Earth wobble after the announcement happens, during their debates. While the cover-up over the nearby presence of Nibiru slowly crumbles, the establishment is stealthily preparing for the Pole Shift and panic in the populace. Recent evidence of this can be seen in the renewed Billionaire Giveaway, in the Windows 10 giveaway, in plans in Sweden for Stockholm 2 under the guise of housing immigrants, and in the wealthy shedding their coastal homes. The Billionaire Giveaway, started by Bill Gates in 2010, was per the Zetas a thinly veiled attempt to placate the masses and an attempt to buy their way into Heaven. They signed the Giving Pledge -- an effort started in 2010 by Warren Buffett and Bill and Melinda Gates -- to encourage billionaires to commit to giving away most of their money either during their lifetimes or in their wills. The pledgers are now 137 strong and hail from 14 countries. ZetaTalk Comment 8/7/2010: There are multiple reasons for the current campaign. One is to put in the mind of the common man that the wealthy are compassionate, thus blunting rage against the wealthy when the truth about the Planet X cover-up is out in the open, the truth about who knew. Another is to ease the rage the common man feels about the current economic depression, where jobs are lost and homes lost, this after a decade under Bush/Cheney where the rich got richer and the poor got poorer, lest someone go postal and shoot them. And yet another is the hope that by appearing generous, abiding by their interpretations that 50% of the time one must think of others and thus this means 50% of their wealth, they will ipso facto be considered Service-to-Other and get to live in our Service-to-Other communities. Such is their naivete. The Windows 10 giveaway is, per the Zetas, designed to be a gigantic snooping operation. Yes, it is wiz-bang with wonderful goodies. Yes, it is being given away free to almost anyone who is willing to install it. And yes, it automatically updates so that anything MicroSoft wants to download into your computer can whisk in unnoticed. The intent? To be able to read the collective minds of the populace, almost before they know what they are thinking, the better to distribute disinformation in a timely manner. The establishment plans to get out ahead of the news. ZetaTalk Insight 6/6/2015: We have repeatedly been asked if the Internet will survive and continue to be open, and our response has from the start of ZetaTalk been that we anticipate that the establishment will not be able to shut it down. The reason is that commerce and industry, government business as well as private, use the Internet extensively and to simply shut it down would create too much havoc for those in power. Their approach has instead been to try to get the populace to use versions of the Internet, connecting to floating platforms like the Outernet or Project Loon. These provide information to the populace but don’t allow updates or email from the populace, but an Internet that is no more than an interactive TV did not generate interest from the public. The Internet was designed to be able to function despite blockages, flowing like water around them. Even if the media, TV and radio, were tightly controlled, the Internet allows the public to provide information to others and learn what is happening around the world. If this cannot be stopped, how can the elite control this? Disinformation is designed to counter the facts, but is most effective when used early so it does not look like a reaction. The facts themselves then are cloaked like a reaction, as they arrive second. To achieve this, Windows 10 will be a gigantic snooping operation, given away free with lots of goodies so hopefully installed on a massive number of personal computers and mobile devices. Sweden is considered by many in Europe to be the go-to country when the rest of Europe floods. But both Norway and Sweden limit immigration and are strict. Why would Sweden then begin to talk about Stockholm 2, a concept rather than a place, where they can house immigrants in the future? Stockholm, the capitol of Sweden, has 430,000 dwelling places at present but Stockholm 2 will required an additional 600,000 dwelling places. Humm. Per the Zetas, they are merely trying to stay below the radar and not raise alarm among their citizens. They anticipate coastal flooding as the globe moves closer to the date of the Pole Shift and the wobble worsens, and certainly anticipate coastal flooding in the Aftertime – but they don’t want to admit any of this just yet. Sweden will now build Stockholm 2.0 to house all immigrants. It’s the Swedish National Board of Housing, Building and Planning that has produced a report, which states that 600 000 new dwellings would have to be built in the coming 11 years, largely because the increase in citizens is “more than expected”. In comparison, Stockholm municipality has 430 000 dwellings. This would be the largest building project ever in Sweden. To make this a reality, large sacrifices are needed from the tax payers, the board states. The board also lists a number of fair and just suggestions to make it easier for immigrants to get a residence, which includes putting immigrants ahead of Swedes in various apartment queues and constructing houses out of old churches. The Swedish political elite have plans to build a new city, funded entirely by Swedish taxpayers, to accommodate the massive wave of incoming immigrants. This radical plan also proposes the confiscation of summer homes and the conversion of old historical buildings and churches in order to facilitate the arrival of new immigrants. Meanwhile, Sweden's welfare system is plummeting as politicians suffer from Stockholm syndrome, trying to be a "humanitarian superpower." Native Swedes have been chosen to carry the weight of the world, sacrificing themselves on the altar of multiculturalism. ZetaTalk Insight 6/6/2015: Clearly Stockholm 2 is not to be located with the existing Stockholm, though the exact site or sites are not indicated. Is the intent to house immigrants? Sweden has been tightening up their immigration standards and pulling back the welcome mat, so what is the real agenda here? We have stated that Sweden intends to take care of its citizens when the Pole Shift arrives, and will do so conscientiously. Its capitol, Stockholm, lies on the water’s edge and will suffer from sloshing in the Baltic Sea and the general sea level rise after the Pole Shift. 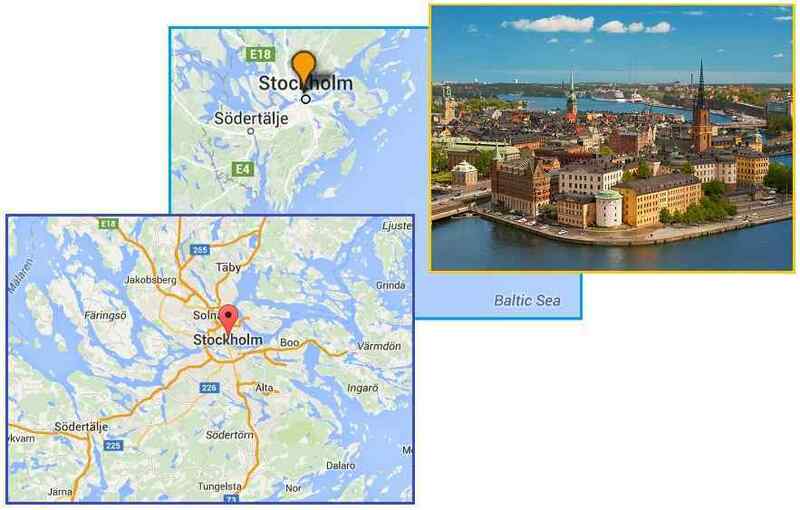 Under the auspices of the Stockholm 2 endeavor, they will prepare existing housing inland and upland from Stockholm. The “confiscation of summer homes and the conversion of old historical buildings and churches” does not involve a burden on tax payers as the buildings already exist. And the fact that Stockholm 2 could be widely disbursed over the country is implied. When the time comes to move their citizens from the coastlines, and from the capitol itself, there will be places to go! The newly released San Andreas movie is a block buster, and highly accurate! Is this what will happen during the hour of the Pole Shift? Yes, and worse. The Zetas have predicted magnitude 9 earthquakes worldwide, which this film depicts for California cities. The Zetas have predicted tsunami, which is depicted, but also global ocean sloshing which it not depicted. The Zetas have predicted hurricane force winds, also not depicted. 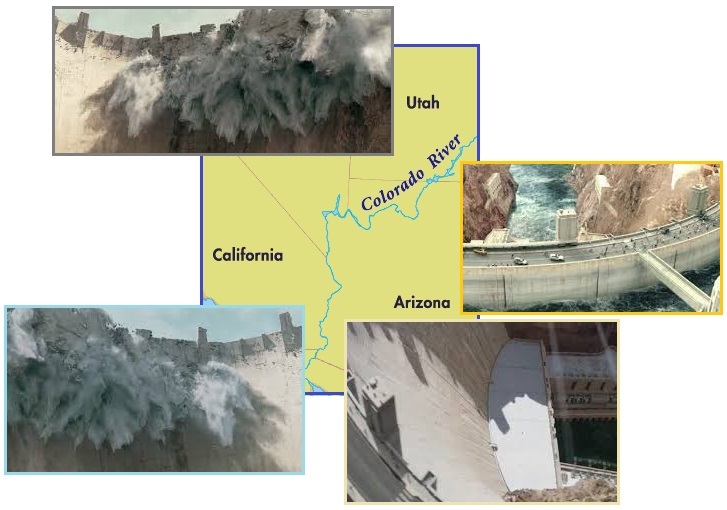 The Zetas have predicted that at the time of the Pole Shift, if not before, that all dams will break and this film shows the Hoover Dam giving way. But the outstanding contribution of this film was to emphasize that predicting earthquakes by using the increase in electromagnetic flow from the rocks is possible. This is indeed an earthquake predictor which can be used by the common man! 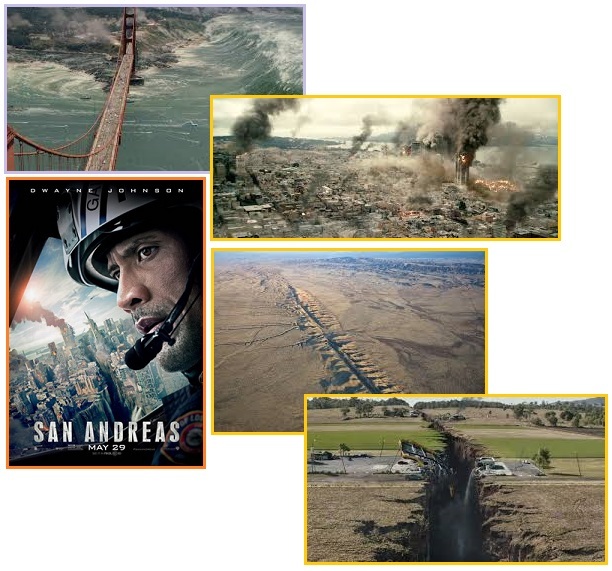 This movie depicts the devastation of California caused by massive earthquakes and tsunami flooding. There are scenes where kind hearted people assist others. Selfish people loot, trample and abandon those in their care. People with no chance of escape embrace before death. Scientists are ignored at first but are then given full media coverage. Law enforcement and emergency workers eventually arrive to restore order and rebuild. I, Nancy, went to see the movie on opening day and listed how closely it paralleled ZetaTalk. The Zetas agree! 1. Hoover Dam breaks (ZetaTalk says it will during the New Madrid adjustment). 2. Geologist describes Colorado River, which he carefully outlines on a map running down from the Hoover, as a river bed which he calls a "deformation" in the crust, thus outlining a hidden fault or plate border. Zetas say river bottoms run along sagging thin crust, which is "drooping". 3. 8's not being the big one, can be followed promptly by 9+'s. Zetas say this about the New Madrid. 4. San Andreas rip point can be seen from the air. This is true already that one can see where the plate border lies from an airplane, nothing new, but emphasized that one side goes up, the other down, and lateral movement. Both true of the present scars there. 5. Tsunami accurately shown. Water pulls away from shore, then in it comes, very high. Period of time after the big quakes too, which is accurate. 6. Concrete fascia on buildings shatters readily, concrete buildings crumble. Metal frame do not deform but hold up but if the ground below tilts or drops, they will too. 7. Magnetics can be used to determine a pending quakes. ZT talks about magnetic screech, from pressed rock, increasing before a quake (pets run away, etc) in the movie they refer to this simply as magnetism, which they show spiking or not. Unsure what magnetism they are measuring, presumably from the rock as they have their laptops with them at the Hoover Dam. ZetaTalk Insight 6/6/2015: This is a commendable movie, in that it sticks to the facts. Is the destruction what can be anticipated during the Pole Shift, or before? It is indeed descriptive of what will occur during the Pole Shift, when magnitude 9 quakes are experienced worldwide. A tsunami is depicted accurately, but in that the San Andreas movie is not depicting the Pole Shift, no ocean sloshing to a height of 500 feet or greater is shown. Imagine LA with such a tide, on top of earthquake destruction, and the reason for the message to be out of the cities when the Last Weeks are undeniable is clear. We have stated that the New Madrid adjustment will precede any major adjustment along the San Andreas, and precede any anticipated break in the Hoover Dam. We have also stated that the Hoover Dam is likely to react to pressure in the bowing of the N American continent by jammed spillways so that the lake water backs up into Las Vegas. But we have also stated that all dams will shatter and fail in some manner during or before the Pole Shift, and the movie provides an apt warning in this regard. We were also pleased to find that our descriptions of electro-magnetic screech in the rocks can be used as a means to predict quakes, a fact known to mankind but not stressed in the media. ZetaTalk Prediction 12/11/2010: Other than indicate that a slip-side adjustment along the San Andreas will occur after this New Madrid, and occur after the Hoover Dam breaks we have not given any timing clues. Great quakes, such as magnitude 9, should not be expected, but eruptions in the West Coast volcanoes should be anticipated. A slip-slide fault line usually does not move all at once, but in a domino fashion, a bit here, a bit there. ZetaTalk Prediction 4/7/2012: What then is likely to happen to the Hoover Dam as the pressure of the N American bow increases, as it surely will prior to the New Madrid adjustment? The Hoover Dam in particular was built so sturdily that it is unlikely to shatter. This was because it was intended to hold back an immense amount of water, and the site chosen because the rock on either side of the dam was considered impervious to erosion or crumbling. What then is likely to happen to the Hoover Dam as the pressure of the N American bow increases, as it surely will prior to the New Madrid adjustment? Spillways are openings in the dams, tubes that run through the dams ending in gates, all of which are vulnerable to being crunched and broken. Jammed shut, what would the water flowing into the lake above the Hoover Dam do? It would rise, and flow into Los Vegas along the ravines that connect the two.